Phylogeny after Rafael and De Meyer (1992), Skevington and Yeates (2000) and Skevington and Yeates (2001). One thousand three hundred and eighty-eight valid species of Pipunculidae have been described and over 2,500 species likely exist (De Meyer, 1996; De Meyer and Skevington, 2000; Skevington unpublished database, 2005). Most big-headed flies that have been studied are endoparasitoids of leafhoppers and planthoppers, including Cicadellidae, Cercopidae, Delphacidae, Membracidae, Issidae, Cixiidae and Flatidae. The only exceptions to this rule occur in the genus Nephrocerus, flies that were recently discovered to attack Crane Flies (Tipulidae) (Skevington, 2005). The potential value of Pipunculidae for biological control has stimulated some work on the bionomics of this family. For example, recent research into the control of the potato leafhopper, Empoasca fabae (Harris), a major pest of alfalfa in mid-western and eastern United States and Canada, involved exploration within Europe for natural enemies to be introduced into the United States (Jervis, 1992) and included rearing of Chalarus for release (Skevington & Marshall, 1997). Current research in Texas is focusing on the discovery of pipunculid parasitoids in the pest leafhopper, Homalodisca coagulata Say (Glassy-winged Sharpshooter). Despite the economic importance of the group, few data on host relationships exist and some genera have no known hosts (for example Allomethus, Basileunculus, Elmohardyia, and Protonephrocerus). Some of the recent Pipunculidae systematists: Top row left to right: Martin Dempewolf, Jeff Skevington, Mihaly Foldvari. Bottom row left to right: Michael Ackland, Marc De Meyer, Jose Rafael, Forbes Benton. 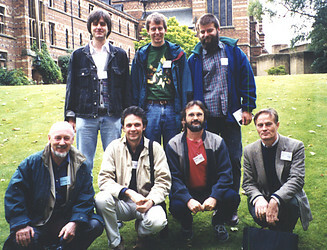 International Congress of Dipterology, Oxford, 1998. 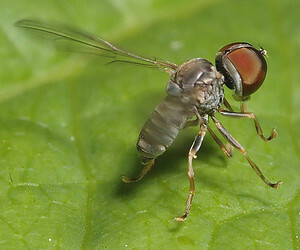 Adults are frequently seen hovering among vegetation; their flight is similar to that of Syrphidae. Adults utilize all terrestrial habitats; however, diversity and numbers are greatest in forest openings and along forest edges. Adult flies feed on honeydew and can occasionally be found in large, mixed feeding groups on Sternorrhyncha secretions (Skevington & Marshall, 1998). Many pipunculids employ the landmark mating system known as hilltopping (Skevington, 2000, 2001). Hilltop collecting is an excellent way to sample much of the pipunculid diversity in an area and often provides large numbers of specimens. Other effective methods frequently employed to capture pipunculids include sweeping, Malaise trapping, and less successfully, using yellow pan traps. Occasionally, mating pairs are discovered hovering in copula or temporarily settled on vegetation. Pronounced sexual dimorphism in pipunculids makes association of the sexes difficult so these occasional discoveries are very useful. Females of most pipunculid species deposit their eggs in early instar nymphs or adults of their hosts. After visually locating a host, some species remove the host from the food plant and oviposit one egg inside each host whilst in flight (Huq, 1982; May, 1979; Williams, 1919), whereas others leave the host in situ (Benton, 1975). Larvae develop to maturity within the nymph or adult hosts. When mature, the larva leaves the host through a break in one of the dorsal intersegmental membranes of the abdomen in order to pupate in the soil, in the litter, at the base of plants or rarely, attached to leaves (Ferrar, 1987; Perkins, 1905). More detailed information on immature stages together with information on rearing techniques can be found in Benton (1975), Coe (1966), Ferrar (1987), Freytag (1988), Huq (1984), Jervis (1980), Morakote & Yano (1987) and Perkins (1906). Pipunculid-host associations are best known for the European fauna (Waloff & Jervis, 1987), followed by Nearctic Region (Skevington & Marshall, 1997) and the Australian region (Skevington, 2001). However, most species have no biological data available. Most pipunculid species attack more than one species of host, but show a preference for a particular set of host species. Only two species have been reared from more than one subfamily of host (Skevington, 2001). Superparasitism and multiple parasitism are rare and survival of more than one pipunculid in these cases is exceptional (Jervis, 1980; Morakote & Yano, 1988; Waloff & Jervis, 1987). Because of their small size, black coloration, and the paucity of external characters, pipunculids are difficult to identify. It is particularly important to have male and female specimens from the same sample in order to associate the sexes. For secure identification it is necessary to dissect the male terminalia. To accomplish this, remove the abdomen and heat in 85% lactic acid for roughly 30 minutes. Remove the macerated abdomen and place it directly into clean glycerin. Dissection involves separating syntergosternite 8 from the remainder of the abdomen. Store the abdomen and dissected terminalia in glycerin in plastic microvials on the same pin as the source specimen. Surstyli shape, presence or absence of a membranous area on syntergosternite 8, phallic guide shape, phallus shape and ramification, sperm pump shape and sclerotization, ejaculatory apodeme shape, hypandrium shape and modifications of the sternites are often informative. In female specimens the ovipositor shape is often useful but few other diagnostic characters are available. Description of new species on the basis of females often complicates the taxonomy of the family and should be avoided unless new character systems are discovered for females. In order to secure the ground color and pruinescence of pipunculids, specimens should ultimately be dried and pinned. Pinning fresh material killed with cyanide or ethyl acetate is the easiest and a number of techniques can be used. The best method for obtaining views of the insect's genitalia involves double mounting. Pinning through the right mesopleuron with a minuten, then pinning to pith is more expensive and time consuming than pointing, but produces excellent specimens that are less likely to require dissection than other pinning techniques. Note that the heads of pipunculids fall off very easily. Some collectors remove the head and pin it separately on the tip of the minuten. Material collected into alcohol is preferably dried with a critical point drier and then pointed or glued directly to the side of a pin. Chemical drying using HMDS (hexamethyldisilazane) or ethyl acetate is also acceptable. Although some researchers prefer to study pipunculids preserved in 70% alcohol, specimens preserved in this way discolor over time and become brittle and difficult to dissect. A key to the genera of Pipunculidae is available in Skevington and Yeates (2001). The first phylogeny of the family was proposed by Aczél (1948). Although not a quantitative analysis, this phylogeny has remained remarkably robust through time. Recent phylogenetic hypotheses proposed by Rafael and De Meyer (1992) and Skevington and Yeates (2000, 2001) support many of the lineages proposed by Aczél. Aczél, M. L. 1948. Grundlagen einer monographie der Dorilaiden (Diptera). Dorilaiden-Studien VI. Acta Zoologica Lilloana 6:5-168. Benton, F. P. 1975. Larval taxonomy and bionomics of some British Pipunculidae.University of London. Coe, R. L. 1966. Some British species of Chalarus and Verrallia (Diptera: Pipunculidae). Proceedings of the Royal Entomological Society of London (B) 35:149-160. De Meyer, M. 1996. World catalogue of Pipunculidae (Diptera). Studiedocumenten van het Koninklijk Belgisch Instituut voor Natuurwetenschappen 86:1-127. De Meyer, M., and J. H. Skevington. 2000. First addition to the World Catalogue of Pipunculidae. Bulletin de l'Institut Royal des Sciences Naturelle de Belgique, Entomologie 70:5-11. Ferrar, P. 1987. A Guide to the Breeding Habits and Immature Stages of Diptera Cyclorrhapha. E.J. Brill/Scandinavian Science Press, Leiden, Copenhagen. Freytag, P. H. 1988. Rearing techniques for Dryinidae and their hyperparasites (parasitic Hymenoptera). Advances in Parasitic Hymenoptera Research 87-7-215:519-524. Huq, S. B. 1982. A contribution to the biology of pipunculid-flies (Pipunculidae : Diptera). Free University, Berlin. Huq, S. 1984. Breeding methods for Pipunculidae (Diptera), endoparasites of leafhoppers. International Rice Research Newsletter 9:14-15. Jervis, M. A. 1980. Studies on oviposition behaviour and larval development in species of Chalarus (Diptera, Pipunculidae), parasites of typhlocybine leafhoppers (Homoptera, Cicadellidae). Journal of Natural History 14:759-768. Jervis, M. A. 1992. A taxonomic revision of the pipunculid fly genus Chalarus Walker, with particular reference to the European fauna. Zoological Journal of the Linnean Society 105:243-352. May, Y. Y. 1979. The biology of Cephalops curtifrons (Diptera: Pipunculidae), an endoparasite of Stenocranus minutus (Hemiptera: Delphacidae). Zoological Journal of the Linnean Society 66:15-29. Morakote, R., and K. Yano. 1987. Morphology of immature stages of some Japanese Pipunculidae (Diptera) parasitizing Nephotettix cincticeps (Hemiptera, Deltocephalidae). Kontyu 55:176-186. Perkins, R. C. L. 1905. Leaf-Hoppers and their natural enemies (pt.IV. Pipunculidae). Bulletin. Division of Entomology. Hawaiian Sugar Planters Association Experiment Station 1:123-157. Perkins, R. C. L. 1906. Leaf-Hoppers and their natural enemies. (Introduction). Bulletin. Division of Entomology. Hawaiian Sugar Planters Association Experiment Station 1:i-xxxii. Skevington, J. H. 2000. Pipunculidae (Diptera) systematics: Spotlight on the diverse tribe Eudorylini in AustraliaUniversity of Queensland, Brisbane. Skevington, J. H. 2001. Revision of Australian Clistoabdominalis (Diptera: Pipunculidae). Invertebrate Taxonomy 15:695-761. Skevington, J. H. 2002. Phylogenetic revision of Australian members of the Allomethus genus group (Diptera: Pipunculidae). Insect Systematics and Evolution 33:133-161. Skevington, J. H. 2005a. Electronic Pipunculidae Catalogue. unpublished. Skevington, J. H. 2005b. Revision of Nearctic Nephrocerus Zetterstedt (Diptera: Pipunculidae). Zootaxa 977:1-36. Skevington, J., and S. A. Marshall. 1997. First record of a big-headed fly, Eudorylas alternatus (Cresson) (Diptera: Pipunculidae), reared from the subfamily Cicadellinae (Homoptera: Cicadellidae), with an overview of pipunculid-host associations in the Nearctic Region. The Canadian Entomologist 129:387-398. Skevington, J., and S. A. Marshall. 1998. Systematics of New World Pipunculus (Diptera: Pipunculidae). Entomological Society of America, Lanham, Maryland. Skevington, J. H. and D. K. Yeates. 2000. Phylogeny of the Syrphoidea (Diptera) inferred from mtDNA sequences and morphology with particular reference to classification of the Pipunculidae (Diptera). Molecular Phylogenetics and Evolution 16: 212-224. Skevington, J. H. and D. K. Yeates. 2001. Phylogenetic classification of Eudorylini (Diptera: Pipunculidae). Systematic Entomology 26: 421-452. Waloff, N., and M. A. Jervis. 1987. Communities of parasitoids associated with leafhoppers and planthoppers in Europe. Pages 281-402 in Advances in Ecological Research (A. Macfayden, and E. D. Ford, eds.). Academic Press Inc. Limited, London. Williams, F. X. 1919. Some observations of Pipunculus flies which parasitize the cane leafhopper, at Pahala, Hawaii, Feb. 11-April 25, 1918. Proceedings of the Hawaiian Entomological Society 4:68-71. Page: Tree of Life Pipunculidae. Big-headed Flies. Authored by Jeff Skevington. The TEXT of this page is licensed under the Creative Commons Attribution License - Version 3.0. Note that images and other media featured on this page are each governed by their own license, and they may or may not be available for reuse. Click on an image or a media link to access the media data window, which provides the relevant licensing information. For the general terms and conditions of ToL material reuse and redistribution, please see the Tree of Life Copyright Policies.